Beamer has never been a “good” eater. Finicky is probably the best way to describe him. Spoiled might be another. Despite some improved mobility, his appetite seemed to be diminished. We resorted to seared bison roast cut up in to small pieces. No rice, no veggies, just protein and hand fed at that. He would eat only small amounts (3-4 ounce portions) twice a day. We also noticed that he had been drinking far more water than usual. Beamer has never met a bed that he didn't like. This is ours at home with bed rails to keep him from falling out. Sunday night things took a turn for the worse. He would not eat anything and he stopped drinking water. We decided that we needed to go back to The University of Georgia Veterinary Hospital in the morning. We met with Dr. Barber, a vet continuing her studies in Neurology. More blood tests, a physical exam and some fluids and Beamer was pronounced “healthy” with the exception of partial paralysis and not eating. We asked if he would stop eating because he was depressed. Dr. Barber felt that this was not the case, but she also didn’t know why he wasn’t eating. The hope was that this would be self correcting and we should give it a few days. We went home knowing that on Thursday we had to travel to Charleston for the Wine and Food Festival that we were covering. We needed Beamer to start eating and regain his strength. Two more days passed with no food. Beamer was becoming very weak. He had lost four pounds since this first started (he was 33.7 pounds when we first went in for his paralysis), but what was most noticeable was that his muscle mass was gone. He had atrophied significantly. His muscles were soft and very weakened. Thursday morning we decided that we needed to visit the hospital again. This time with a different focus. Forget the paralysis for a moment and concentrate on why he is not eating. We knew that he had to see an Internal Medicine Vet and not Neurology. So, we stopped in Athens, Georgia at the Veterinary Hospital on our way to Charleston. This time Beamer went through a different set of tests. His belly was shaved and they performed ultrasound as well as a series of x-rays. The goal was to rule out tumors and possibly cancer. The concern was that the trauma of the raccoon fight, the rabies vaccine and subsequent paralysis may have triggered cancer. Stress and trauma are known to trigger latent diseases. In addition to radiology, Beamer went through more blood tests and a physical exam by a different group of specialists. The verdict, Beamer is in great health, except for the paralysis and he isn’t eating. The recommendation was more fluids and to try different foods and force the issue. The doctors felt that even if he didn’t eat for several more days it would not be the end for him. It was suggested that we run a series of more invasive tests if things did not turn around over the weekend. However, we did not want to put Beamer through this battery of tests since there was no real indication of what they were looking for. They tanked up Beamer’s fluids and we left Athens that evening and and headed to Charleston, South Carolina with Beamer as our sidekick. We arranged for a pet sitter to be with Beamer in the hotel while we were working the Wine and Food Festival. 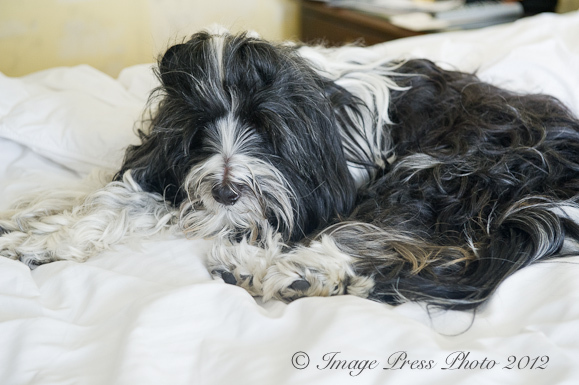 We want to thank the Charleston Place hotel for their pet policy that allowed Beamer to be with us. Charleston Place is the finest hotel in Charleston, SC. Beamer fully endorses it. Once again Beamer showed some signs of improvement over the weekend. There seemed to be a bit of a bounce in his labored steps and he was eating treats but still not real food. Beamer seemed to enjoy this mini vacation, especially the big fluffy bed at our hotel. He snuggled close at night until Sunday when he got very sick. He threw up twice. (Not on the bed and it was well controlled.) The fluffy bed and beautiful hotel room were spared. Even Beamer knows how to be a perfect guest. We attributed the vomiting to the rich treats and no real food. We headed home to Atlanta and made an appointment at the Veterinary Hospital for Monday morning. This time we were more focused on alternative ways to get Beamer eating again. We were more interested in medications that would stimulate his appetite. Would anti-depressants be an option? We do believe that Beamer is depressed. This time we were also open to giving him steroids. We knew this might be Beamer’s last chance to turn things around. If we don’t get his lack of appetite figured out he would not be able to recover. After many more hours of examinations and consultations, it was strongly recommended that Beamer remain at UGA for fluids and further tests. These tests included anesthesia to do an MRI, a lumbar puncture (spinal tap), biopsies of his leg nerves and muscles, endoscopy (along with a biopsy of the digestive tract) and possible placement of a feeding tube. As you can imagine, this was a bit overwhelming for both us to deal with and for Beamer to be able to tolerate at this point. We instead asked for time to think about this and make decisions. We asked that they give him subcutaneous fluids and we went home with appetite stimulants, stomach meds and Prednisone. The appetite stimulant had no effect on Beamer’s desire to eat. We resorted to force feeding with a syringe to try and keep his strength up. Unfortunately, this gave him diarrhea at midnight, 2 am and 4 am. We were both exhausted and knew this had to stop. He was losing more fluids and getting weaker and more lethargic. Dr. Barber (at UGA) was calling us at regular intervals to check on Beamer and strongly suggested we bring him to stay with them for a few days for fluids and the tests that she previously proposed. This is where it became very hard for us. We got in the car yesterday and headed to UGA not knowing what to do. We were incredibly emotional having very little sleep over the past four weeks. We have been upset, angry and confused at all of this. We knew we needed to do something, but we were not sure that we would agree to all of the tests. At this point, is it more for us or for Beamer? The vets at UGA felt that they could find the problem and get him well, but at what cost emotionally, physically and financially? We have heard many stories of dogs that had gone through similar problems with no medical resolution. On the way to Athens, I spoke with two Tibetan Terrier owners who encouraged us to not put him through any more tests for all of our sakes. I asked Roger to turn the car around and go home. We would keep Beamer here with us and start Prednisone and take one day at a time. We went to our regular vet who showed us how to administer subcutaneous fluids at home. She gave him a B-12 shot and we went home with a plan to try Prednisone and the stomach meds for a few more days. We wanted to see where this would lead without any invasive and potentially dangerous tests. We spoke with Dr. Barber about our decision to not go on to UGA. I told her, as we had discussed several times, if there was a compelling reason to do a test we would understand that. However, at this time they have no idea what is wrong and could only offer a battery of tests to try and disclose what ails Beamer. Our fear is that they will continue to find nothing and they have agreed that is a potential outcome. We felt we were entering a period of palliative care with few options. This morning (Thursday March 8th) I received a return phone call from Dr. Jean Dodds, one of the leading authorities on the negative effects of rabies vaccinations in the United States. She returned my distressed phone call from two days ago and asked what was happening with Beamer. She says he has a classic case of Vaccinosis, which is a bad reaction to a vaccine. While most vets do not want to admit that a vaccine can cause this, it is becoming more commonly recognized. 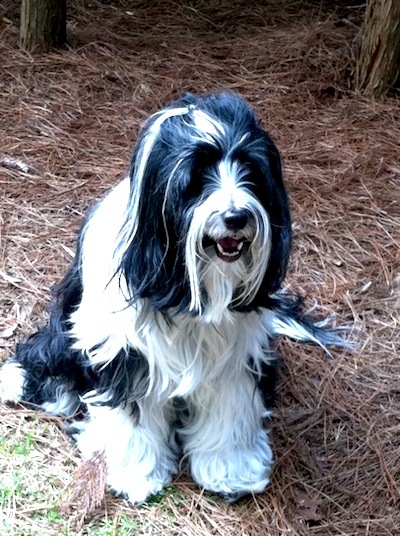 She suggested that we see a well-known homeopathic vet and nutritionist here in Atlanta, Dr. Susan Wynn, ASAP. She also recommended two homeopathic remedies, Thuja and Lyssin, to detox his system. We are in the process of obtaining both remedies and have an appointment to see Dr. Wynn on Monday. Even with the referral and Dr. Dodds personally calling Dr. Wynn, we could not get in to see her for another four days. We know that Beamer needs attention as soon as possible but this was the best we could do. Dr. Dodds was in favor of the Prednisone and gave us hope that we can turn this around with time and these homeopathic remedies. She was very frustrated that the regular veterinary community does not recognize this classic reaction to a rabies vaccine or admit that Beamer’s condition was caused by the rabies booster. That is a topic for a later post. Dr. Barber, from UGA Veterinary Medical School, contacted us again this morning and I updated her on all of this latest information. She was very much in favor of going this route and trying some homeopathic treatments. Her heart is in the right place and I know that she genuinely wants to make Beamer well. She and the team at UGA want to find an answer to his illness. Dr. Jean Dodds said they will not find anything on these tests because she firmly believes it was the rabies booster and it does not present in a familiar manner. She has seen it too many times. We are inclined to agree and are staying with this plan. Beamer has started to eat and drink better since we started the Prednisone. We are monitoring him very carefully and are always with him. He enjoys going for car rides (except to see the vets), he likes to sit outdoors and take in the fresh air. He likes his bison rare, his chicken roasted and his water with ice (stirred..not shaken). Whatever he wants to eat or drink, he will get. If we need to give additional fluids, we now can administer fluids at home to avoid the stress of another vet visit. Yesterday we were talking about having to euthanize him at some point if things did not look up. We discussed all of our options, cried a lot and were very depressed. Today I feel like we are in a much better place. We have hope that we can turn this around. We will try the homeopathic remedies after meeting with Dr. Wynn next week to see if we can “detox” his body. In the meantime, he is at home with us, where he should be, enjoying his big fluffy bed, his backyard and all the comforts and love we can shower on him. Sorry to hear what you guys have been going through 😦 I am glad though that there are Docs out there that keep an open eye to what actually happens rather than stick to what they have been taught years ago! G: My heart goes out to sweet Beamer, you and your husband. I’m thinking about you guys. I know it’s emotionally draining and seeing or hearing some good news would be most welcoming. I look forward to hearing that things are taking a turn for the better…call me if you could use an ear..
You guys are the best parents any child could ask for! You understand that Beamer is a Southern boy and requires ice in his water. Rare Bison and roasted chicken… I think my dog is going on strike after hearing your post! 🙂 We wish you peace and healing. And a happy healthy dog! I am glad you guys are now thinking outside the traditional box. There is a time and a place for Western medicine, even veterinary medicine, but when it’s established care protocols (ie: boosters) that are the cause of the problem, it’s time to look elsewhere. I’m glad he’s eating a little better. You guys are troopers, and so is Beamer. I am certainly keeping you in my thoughts and prayers. We read every word of your update and wiped away the tears as each sentence was read. Many prayers for health & healing continue for Beamer & you all; we have faith that Beamer will continue with his healing. If only there were time for 50 pages, you would know how much what you are going through is understood here…someone sent me a quote during one really tough time, just as you are going though, that said when things get this bad, you grab on to faith like you’re going upstream in a downstream and you spot a log, grab it, & with all your might, hold on – things will get better. Keep holding on; lots of good people are wishing very good times for you all. ….here comes a group hug from Rose & me and a lot of love. I wanted to know, but was afraid to ask. I think it’s terrific you are in a financial position to do this. I also think that’s a smile on Beamer’s face in the last photo. I will continue to think only good thoughts. You are all already blessed. So glad that Beamer is possibly turning the corner. You and Roger are amazing! We are praying for healthy recovery for Beamer and look forward to the summer when Beamer and Dodge can play. Hi Carolyn, Beamer always looks forward to seeing Dodge! I hope that he will have the energy and strength to be able to come and say hello this summer! That is our goal! Himalayan Dog Food Seasoning found at himalayandogchew.com for $5.49 and ii is sprinkled too on dog food. Hope Beamer and the whole family is having a great weekend. Hang in there. 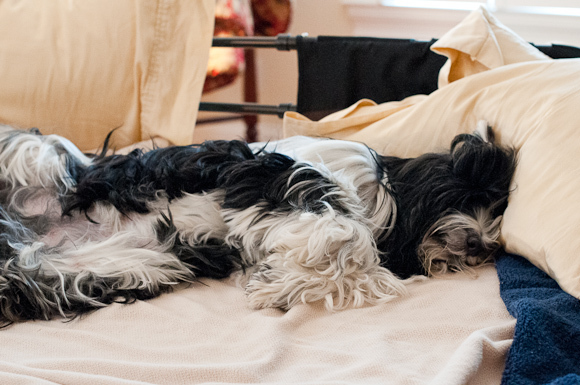 Our dog had pancreatitis and we almost lost her. It was Dr. Dodds who recommended fresh frozen plasma right away, but it was almost a wk later and a near death set back before she got it. That treatment was the turning point for Maisy’s return to health. Still, our girl did not eat for 21 days. Her internal med vet at the time told us several times, “Dogs can not eat for 21 days and do just fine.” On day 21, Maisy started eating. She is now on a strict prescription diet and hasn’t had another episode in 4 yrs. She did lose about 7 lbs during the ordeal. We did continue to offer food frequently during those weeks, but did not force the issue. Good luck and many get well wishes are sent your way.